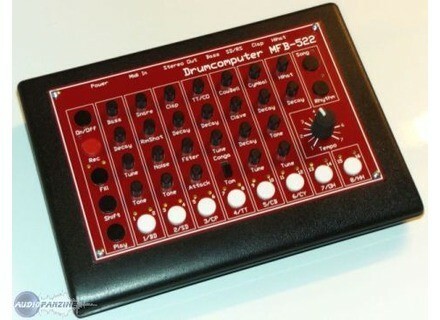 MFB-522, Drum Machine from M.F.B..
11 instruments available (BD / SD / RS / CLP / TT / CGS / CB / CL / CYM / HH editable via the interface. 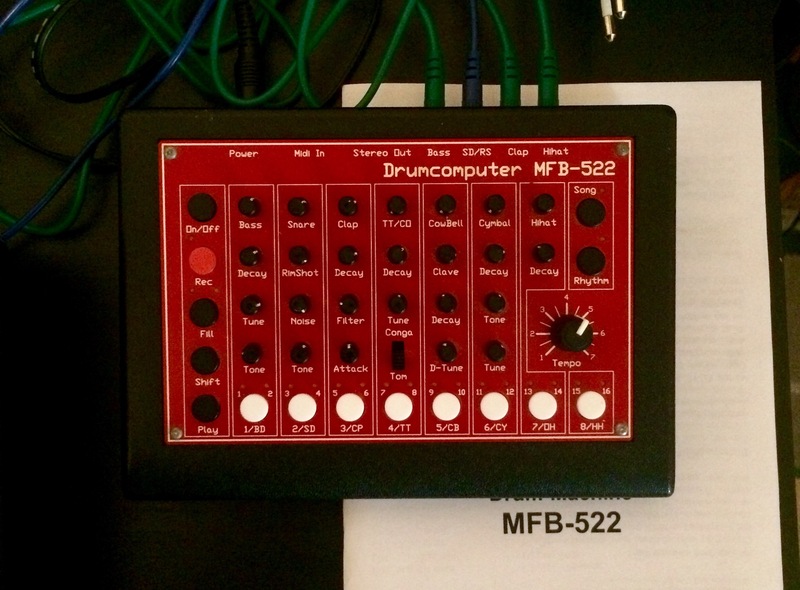 Step by step sequencer, read or not: COOL! General configuration very simple, at least on the issue because all the settings are under the fingers. Sounds right for my use. Realistically, a machine of this caliber at this price, it&#39;s totally unexpected, especially considering the sound quality of each instrument. 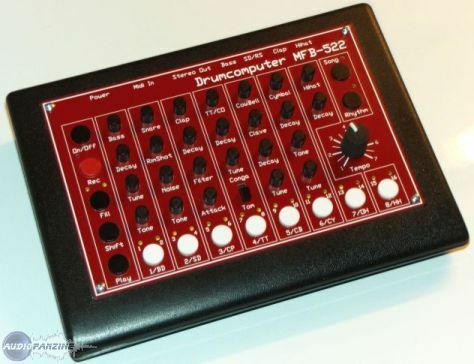 While it&#39;s true that rolls a "ambiance" TR808 (flirting with Drexciya soon), but this little machine a strong character of its own, which expels the pompous clan of "clones". This is a drum that has its sonic character and very little fault that level. Cleaner than volca beats, more versatile too, the sound is really fat. In a mix it is eye catching and respect (in prods uncharged acids such as tracks of Chevel for example) or ask the atmosphere (as in the prod Galaxians or severe groove 707 which is one of the pillars of their sound, if we set aside the synthesizers that are also fantastic, but I&#39;m HS). Personally, I use separate outputs whose level is more than honest. 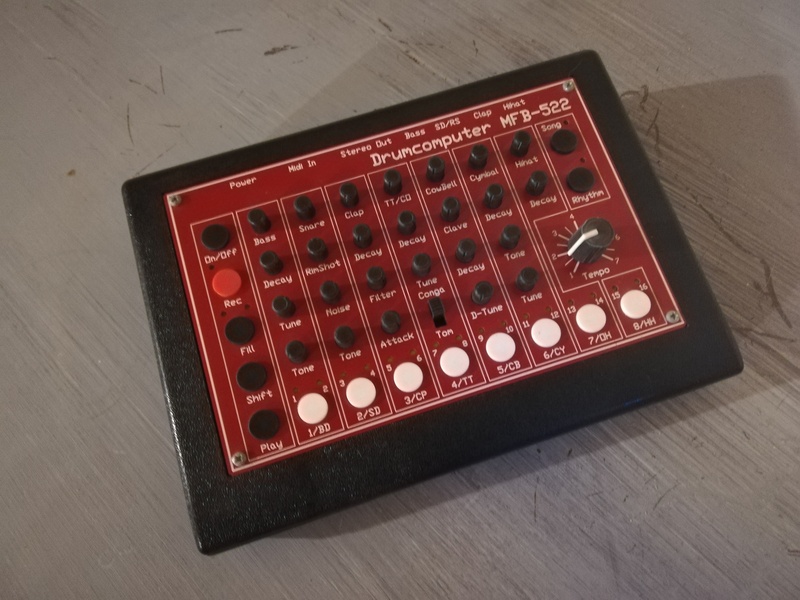 I ts route the instrument except bass drum to a buss powered by a big tube preamp: guaranteed income, this is where I Pité I will keep this machine for quite some time. In detail: the kick is really cool, a long decay be obtained for little prods to RUN DMC or Cybotron. We also get a little kick drum all light. Again, saw the second kick drum drier! The Snare Drum is great too, its almost tomtomesque a snare rolandèsque very crispy, many things are possible and it is very powerful (I compress slightly in DP4). Rim it is a little light in terms of adjustability (just the volume), but it is present in the mix. The Clap is fantastic, it can be super super hot, fat, skinny, minimal, maximal, short, long. Super! Although seen as the "second" clap, drier ..
Tom-toms and congas are also very successful, we can not use them at the same time in a pattern but can still live together if they do not share the same pitch. Note that afternoon, the two are intrigues by the same score, the less cool but not insurmountable. Setting the tone will be for all three toms or congas. The Cowbell Clave and also shares the same keys, so not possible to make them sound in mm time but a good time as a cowbell in mm clave I do not see much use anyway! The cowbell is nice on little Detuner and suddenly get a sound a bit obscure. It was also access to a setting of decay for this cowbell. The sound of slave has a fixed quickly so we limited but again he slams well frequency. The cymbal is present and can also serve as hats, but I find more anecdotal. Note that the tune knob cymbal is shared by cowbell and HH, not silly insofar as when one is tune to the song, the rest follows, but we would have liked to choose. The Hats are very useful, very sweet and crystalline something very bold they can be used in many situations. You have probably gathered, I&#39;m totally crazy about this bike, yet it&#39;s not my only analog drum machine. She has a special place in my set up. Although the individual outputs (or so) are, in my opinion, a must when in a separate outputs péamp we go, it changes very much the situation. The machine is not completely silent, but is much much cleaner than Volca Beats. (But dirtier, any action taken as larger machines like jomox and roland). Panning of instruments in stereo-out mode is not silly at all, on the contrary I find it much thought. With a well measured reverb, the atmosphere very boogie funk 80s ca obtained a hit well and is very fonkyé! A note on my copy, the cowbell generates a slight noise even when not intrigue. The feature I like least is the position of the on / off button for the shot very poorly thought out, false manipulations are very vites arrivals, especially in a concert. The plastic case is horrible, it&#39;s the price to pay for a sonically very successful machine, but the floor price. It lacks the basic copy / paste functions, which proves cruel when you wish to program patterns with just Peites variations. But again, did you see the price, Lilly? Cruise Castillo's review (This content has been automatically translated from French)" Honest"
It would be unfair to criticize the features or even building, insofar MFB keeps its promises at all levels. Its creators describe it unreservedly as a "808 poor" since the release of their tanzbar, it's pretty realistic. Defects and advantages of the interface are visible at first glance, almost. The knobs, large enough to be handled, are really small long. Programming is not odd and even learns a wink. Access to the programming tracks "shared" and "short" versions is only one or two keystrokes close. For toms / congas against by it gets a little boring, but it's still acceptable because three toms are better than one. The sequencer offers three levels of swing (why not ...), a variation ("Fill") and especially the ability to change patterns on the fly while rocking reading to writing. No chaining pattern on the other hand, aside from "Song" mode. The main stereo output offers a panoramic investment instruments quite correct and separate outputs (who actually deserves to exist for a device of this price) allow the whims of each on a console or after recording. The output level is not very high but reaches 0 dB - not enough to get a rimshot for a "trigger out". Level / noise ratio is okay at best. Power "slim" but quite cheap is probably not unrelated. * He Has an effects section? * The general configuration is it simple? * The manual is clear and sufficient? * Editing sounds and effects is it easy? * The sounds they suit your style of music? * The expression is good? (Reaction velocity, aftertouch)? * What are the sounds you prefer, you hate? * How long have you use it? * Did you try many other models before buying it? Not a lot, I used samples and fell in love kick mfb sampled (in EZ Drummer). When it comes to buy a BAR, I did not hesitate for this reason. And I was not disappointed. * What is the particular feature you like best and least? * How would you rate the quality / price? * With experience, you do again this choice? 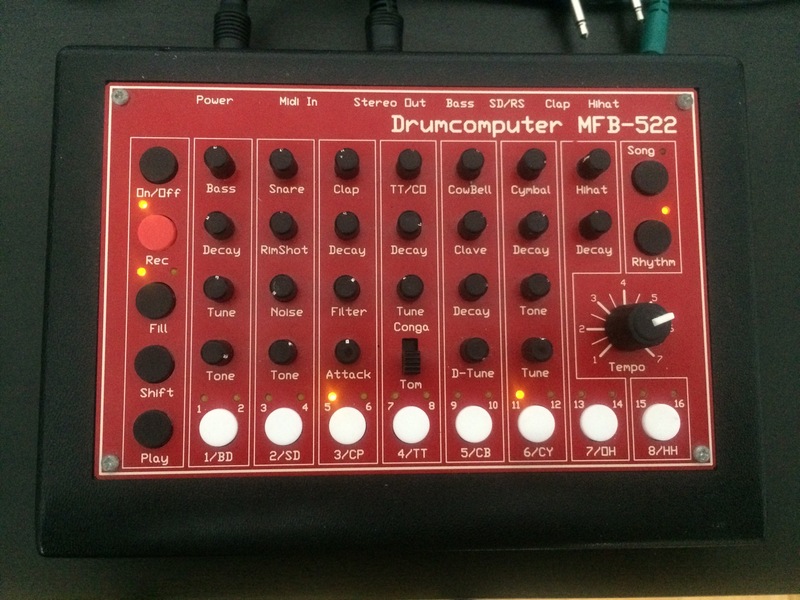 Synetix's review (This content has been automatically translated from French)" This is not a clone of the 808"
Simple enough programming to enter notes on the odd resolution of 16 you have to press another.